Do you want to reach almost 500 of the most active, influential women in Hampton Roads? Then you want to advertise in Highlights, the newsletter of the Junior League of Hampton Roads (JLHR)! Highlights is distributed three times a year to the members, sponsors and supporters of the JLHR. Advertising in Highlights is easy! You can purchase your ad(s) below, complete a paper contract (click here) and fax, mail, or email (Highlights@jlhamptonroads.org and volunteer@jlhr.org) the form to us. All advertisers must adhere to size specifications, standards and policies listed here. The publisher’s schedule of ad copy deadlines must be observed in order to ensure publication. Mailing dates are approximate and subject to minor flexibility due to design processes. All advertising is subject to publisher’s approval. Submission of an ad contract does not guarantee an ad will be run. Advertisement space is limited in each issue of Highlights. Should an advertisement not run, the ad fee will be returned to the advertiser.The JLHR reserves the right to reject advertising which, in the opinion of the publisher, is not keeping with its publications standards. When change of copy is not received by the closing date, copy from the previous issue will be inserted. No advertisement may be cancelled after the deadline. Appearance of an advertisement in Highlights does not constitute a recommendation or endorsement of that product or service by the Junior League of Hampton Roads. Liability of the publisher for any error for which it may be held legally responsible is limited to the cost of the advertisement. 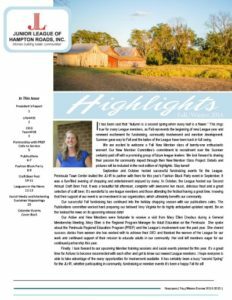 Questions about the contract, ads or Highlights publication, contact Tami Park Farinholt, Highlights Editor, at Highlights@jlhamptonroads.org. For specific questions regarding mailing, faxes, or online submissions of contract, please email volunteer@jlhr.org or call JLHR headquarters at (757) 873-0281.